How much does it cost to travel to Peru? How much money will you need in Peru? S/.152 ($46) is the average daily price for traveling in Peru. The average price of food for one day is S/.39 ($12). The average price of a hotel for a couple is S/.144 ($44). Additional pricing is in the table below. These average travel prices have been collected from other travelers to help you plan your own travel budget. How much money do I need for Peru? Peru sits on the western side of South America against the Pacific Ocean and intersected by the Andes Mountains. The country is a must see for most travelers heading to South America. While the most famous and important site in Peru is Machu Picchu, there really is so much more to the country than this one sight. There are many Andean Highland towns that are fascinating to explore. You can head to the Amazon Basin and stay in a jungle inn, which is a fascinating and unique experience. Many towns also have traditional festivals that are a highlight for many travelers. You also shouldn't leave Peru without visiting some of its markets and purchasing some of the area's famed textiles as souvenirs. The growing popularity of Peru as a tourist destination means that you are unlikely to experience the popular sights on your own, but you will benefit from the improving infrastructure and services that have been established specifically to help travelers. It's possible to travel around the country in comfort if that is the desire, but if you are budget conscience, there are many affordable options as well. Food is delicious and well flavored. Rice and potatoes are a staple and usually coupled with meat. Also be sure and try mazamorra morada, a purple custard dessert. Depending on your travel style, you can find yourself spending more than you expected during a trip to Peru. To keep your budget in check, consider skipping some of the more touristy options and stay in hospedajes, which are small, family owned hotels. They're more affordable and you'll know your money is staying in the local community. Like most touristy countries, there are peak and low seasons in Peru. If you're on a budget the best time to visit the country is during the spring and fall months when the crowds are still at a minimum, the prices are lower, but the weather is nice. However you decide to visit Peru, definitely allow yourself enough time to truly experience the country. Visit more than just Machu Picchu and you'll leave with a much more fulfilling and memorable experience. Most cities throughout the country have an extensive bus system which allows access to most neighborhoods. The buses are generally cheap and reliable, although the system can be a little confusing to figure out at first. Taxis are another good option if you're traveling late at night or can't seem to find your bus. Generally they are not too expensive, but inquire about the price before you get in the vehicle. The nicest intercity bus option is the first class express bus. This is also the most expensive option, but many consider it worth the extra price, particularly for longer trips. There is usually a video playing, and if you are hoping to sleep, bring earplugs, as the video is usually turned up quite loud. If you'll be traveling around by bus, make sure you have a rain cover for your luggage. Even on the express buses the luggage is often thrown on top and open to the elements. If it rains, your luggage will get wet, so come prepared. Also, make sure you keep your valuables on you during the entire trip. As in many countries, you'll likely run into touts at the bus and train stations. It is best to avoid these touts as they often are involved with scams, or at a minimum, will charge you too much. Simply ignore them and continue walking towards the exit and they should not be a problem for you. If you're planning to do a trek it is best to check out several companies before you commit. The price, as well as the quality of the guides, can vary dramatically from company to company. Ask around until you find a place that you are comfortable with. Also, make sure you understand what is included in the price of your trek in regards to food, equipment, etc. Group sizes can vary as well so make sure you have all of the proper information before you make a commitment. Machu Picchu: This famous ancient Incan City sits high in the Andes Mountains and is the most famous sight in Peru. 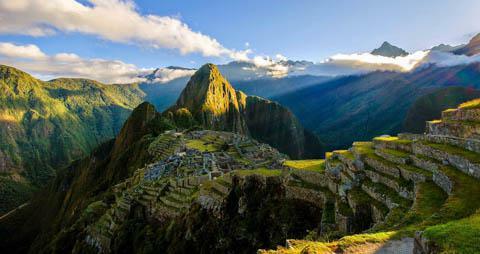 Most people travel to Peru to specifically visit Machu Picchu, which can be reached by either a famous hiking trail, known as the Incan Trail, or a train that travels to the nearest town. Chan Chan: This is another impressive city of ruins that remain from an ancient mud city. It is also a UNESCO World Heritage Site and is in the Peruvian region of La Libertad. Huascaran National Park: This is a great national park in the Cordillera Blanca range. Within the park you will find Peru's highest mountain, also named Huascaran. Peruvian food is very varied. In the cities you'll see a Spanish influence on many of the dishes. The staple ingredients throughout the country include rice, potatoes, yuca, and corn. On the coast there is fish that is common in the diet, but more inland you'll find more vegetables and meats. Anticuchos: This traditional style kebab is made out of a richly marinated and spicy beef heart. It's typically marinated in vinegar and cumin and served with either a boiled potato or bread on the side. It's a cheap option for a meal that's available everywhere. You'll find street carts and vendors selling anticuchos in most towns around Peru. Mazamorra Morada: This is a purple custard dish that is made from purple corn. It's a sweet dessert that is available throughout the country but is most common in the cities. It's available in all types of venues, from the most simple street carts to the country's finest restaurants. Picarones: This is a donut like dish that is made with fried yam dough and served with a sweetened syrup topping. It's often served as a dessert dish that accompanies anticuchos. The dish dates back to the colonial period in Peru when it was first introduced to the country.